They've been slinging steaks for 26 years, essentially without interruption, at the Backyard Steak Pit in far north suburban Gurnee. Then along came Monday's fast-moving, violent storm and the ensuing power outage. 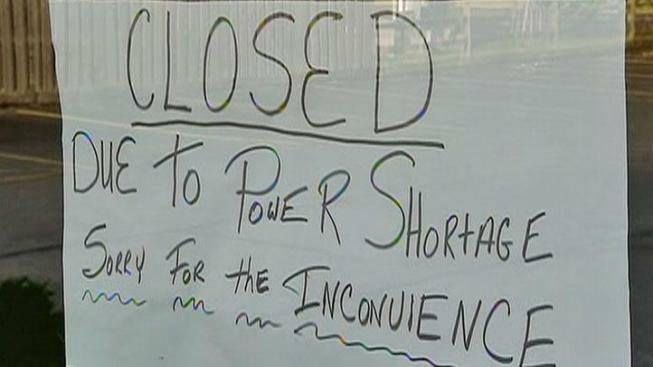 Now going on a third full day without electricity at the restaurant, owner Mike Shannon conceded some measure of defeat Wednesday. He tossed the restaurant's food inventory into the dumpster, where it now awaits pick-up. "To have something like this is just devastating for everybody," he said. Shannon said he checked with his insurance agent to determine if his losses -- which he figures may eclipse $10,000 -- will be covered by his policy. He said he expects to be fully reimbursed after paying his deductible. "When we got the policy, we talked about occasions like this for the 'what if,'" he recalled. That said, a natural disaster like this is an "eye opener" for small businesses now trying to calculate their losses, according to Julie Demos, insurance analysts for Northbrook based, Total Insurance Service. "The onus is not with ComEd but on your insurance agent. You can't count on ComEd to cover your losses," she said. Across the street, at Salutos Italian Restaurant, they estimate their losses to be in the thousands of dollars, and owner Bob Bode isn't sure his insurance policy will cover everything. As he cleared his cooler of expensive boxes of steaks and calamari, he pointed out that he's covered up to $10,000 in food, but nothing above that mark. "We basically had to throw away every bit of prepared food, and most of our menu items are hand made from scratch," said Bode. Bode, who has been in business 20 years, said he's never had to deal with an outage like this. He figured his business interruption losses would be covered by insurance. Now, he's not so sure. "Unfortunately, it's a natural disaster. I don't know if my policy covers acts of God," he said. Demos said it's essential that small businesses find an agent who understands their business and tailors a plan accordingly because some weather-related losses might be eligible for coverage. "It's the role of the insurance agent to make sure they know their clients, they understand their operations, and they're offering them proper coverage to insure them against exposure to loss," she said. Homeowners, generally speaking, seem to be out of luck. ComEd characterizes this outage as an "Act of God." As a result, it will not compensate homeowners for spoiled food or other storm related costs.